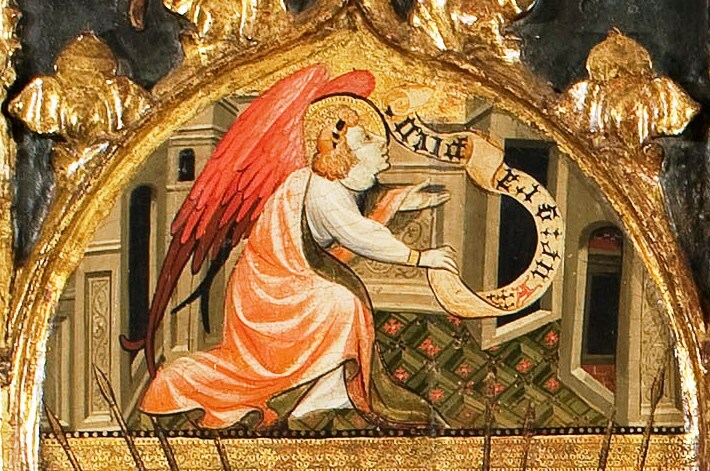 On the basis of its style, a small fragment from an altarpiece in the collection of the Ulm Museum (Germany) can be attributed to the painter Joan Mates, one of the principal exponents of Catalan Gothic. 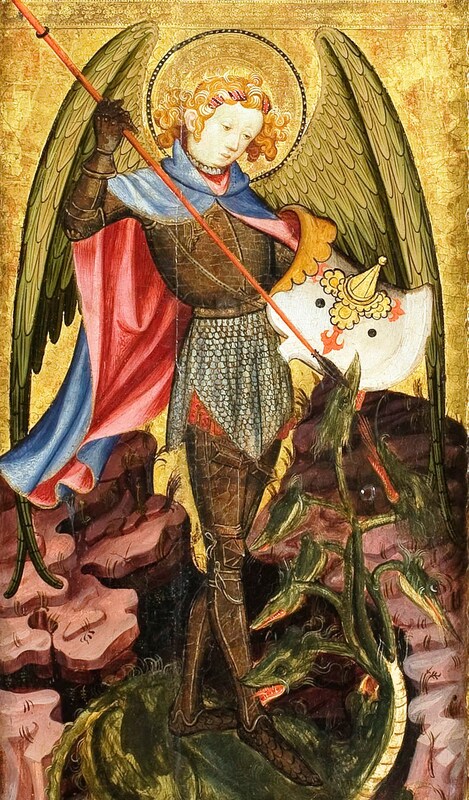 With the attribution of this piece – of singular iconography – to this artist, not only has the painter’s catalogue grown, but the work has also been placed back in its original artistic context, Catalonia in the Late Middle Ages. From 27th April to 21st September 2014, the German federal state of Baden-Württemberg commemorated the 600th anniversary of the holding of the Council of Constance with an interesting miscellaneous exhibition, Das Konstanzer Konzil. Weltereignis des Mittelalters 1414-1418 (The Council of Constance: A World Event in the Middle Ages 1414-1418). The show, organized by the Badisches Landesmuseum in Karlsruhe and curated by its director, Dr Harald Siebenmorgen, was held in the Konzilgebäude Konstanz, on the shores of the famous lake. 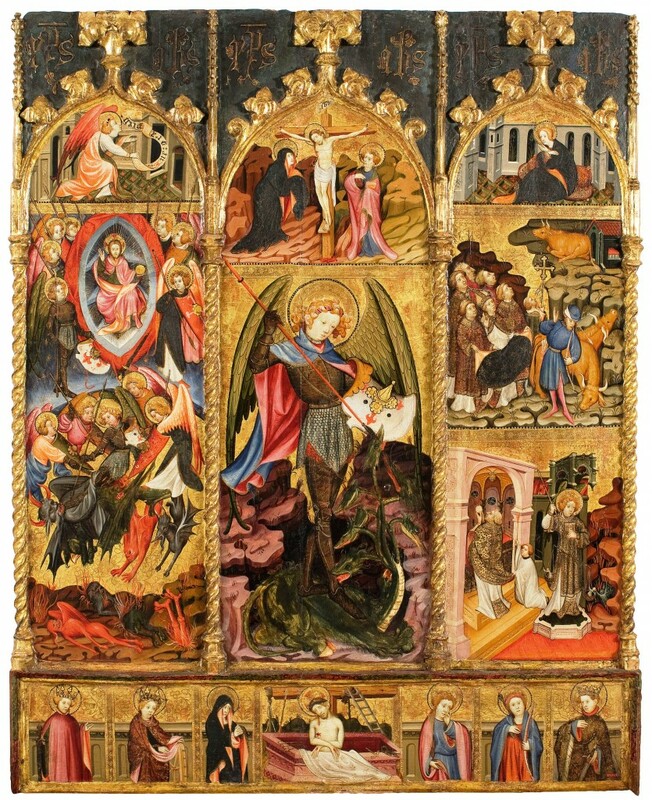 Like many other European institutions, the Museu Nacional d’Art de Catalunya contributed to the event through the loan of a work from the Gothic Art collection, the Altarpiece of Saint Anne, ascribed to the painter Bernat Despuig. This group was not the only Catalan production exhibited there, as an unexpected guest made an appearance. The Ulm Museum loaned a delicate fragment from an altarpiece whose authorship is disputed (inv. 1989.9291), traditionally identified as a Germanic production of the early 15th century. Observing the piece from our perspective, however, allows us to claim that the work is actually a vestige of a painting done by Joan Mates, without doubt one of the principal Catalan Gothic painters, active in Barcelona in the early decades of the fifteenth century. It is a small piece (50 x 32 cm) that has been cut out, in which we see a group of six angel singers gathered on the banks of a watercourse, almost certainly a river, which springs on the mountain that is partially hidden behind a thick coppice. 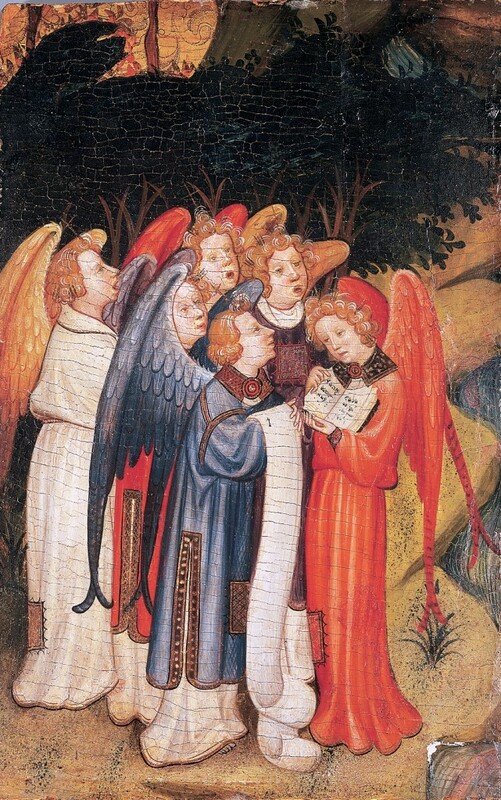 One of them is holding a book and another holds an open scroll, around which the rest are singing hymns, as denoted by their open mouths. Childlike in appearance, they all have light coloured eyes and curly blond hair, and their wings are of different colours. The liturgical nature of the group is emphasized by the priestly vestments and the cross-bearing diadems they are wearing. Although the area of the painting that has been conserved is certainly very small, the landscape features and the physical types that are depicted perfectly match the tender, kindly style of Joan Mates. Among the many similarities that could be pointed out with the works in his catalogue, there is the identification of the angel singers of Ulm with the angelic beings that fill the panels by the painter that have been conserved, for example the Altarpiece of Saint Michael the Archangel from Penafel, one of the works by the painter that, along with the central panel of the documented altarpiece of Saint Sebastian from the Pia Almoina in Barcelona, and the fragment of Mourning over the Dead Christ from the Palau de la Generalitat, are conserved in the Museu Nacional d’Art de Catalunya. In a forthcoming study attempts will be made to gain more knowledge of the fragment and its original group. 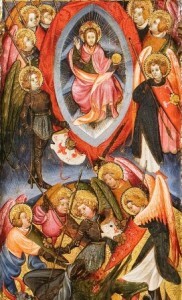 We shall commence by verifying or refuting the possibility of it belonging to the dismembered altarpiece of the Saints John, now dispersed among several public and private collections in Catalonia and elsewhere, and which, significantly, is missing the now lost compartment of the Baptism of Christ. For the moment, we shall make do with adding the piece to the generous known catalogue of Mates, which has been increased in recent years thanks to various discoveries. In 1995, Joan Sureda attributed two compartments with the Flagellation of Christ and the Mourning over the Dead Christ to him, which are conserved in the Galleria Corsi in Florence and up to then had been overlooked by Catalan critics. 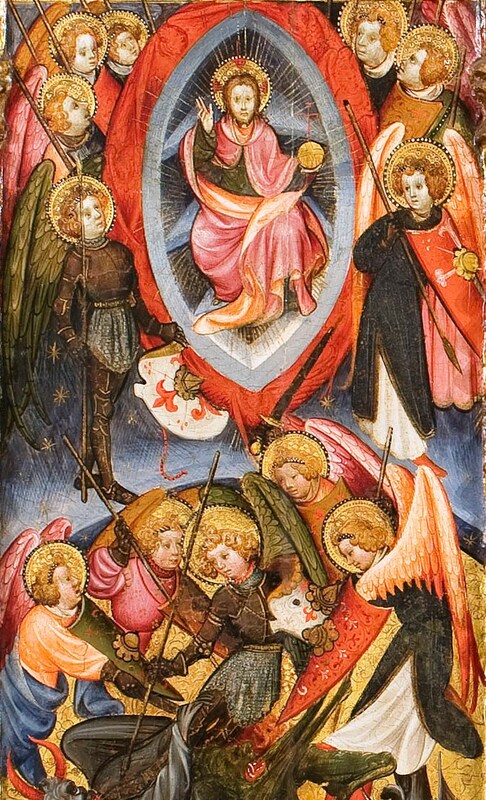 Shortly afterwards, in 2001, Maria Carmen Lacarra ascribed to him a magnificent central altarpiece panel with Saint Peter and Saint Paul, now in the Museo Diocesano in Huesca, which had remained hidden as the support for an altar frontal done in the early nineteenth century. Finally, more recently, Rosa Alcoy attributed to him a small panel with Saint Peter, possibly a fragment of a predella, which was then on the art market.